Former Denel chief executive Riaz Saloojee gave the Zondo Commission of inquiry insight into meetings with the Gupta family saying, among others, he attended three meetings at the request of so-called Gupta lieutenant Salim Essa. He is reported by Johannesburg digital daily Times Live as telling Deputy Chief Justice Raymond Zondo he (Saloojee) was contacted by Essa in 2012 and asked to attend a meeting that would be both in his and Denel’s interests. “I was contacted by Essa and he indicated he would like me to meet some people and it would be in Denel’s interests and in my interests to meet these people. He also indicated it would be important to attend such a meeting because it had support at the highest level. “With all the publicity surrounding the relationship with the Guptas and Essa, when he said ‘the very top’, he meant the head of the executive,” Saloojee told the commission, referring to then president Jacob Zuma. Justifying his decision to attend he told the Commission Denel had “many such meetings with other institutions and entities”. He was apparently driven to the Gupta compound in Saxonwold, Johannesburg, where he was introduced to Rajesh Gupta and “pleasantries” were exchanged. It was, according to Saloojee’s evidence, the first time he had met a Gupta family member. He was then taken to another room where Atul Gupta and then Public Enterprises Minister Malusi Gigaba, effectively Saloojee’s boss, were. Gigaba is reported as telling Saloojee “these (referring to the Gupta brothers) are my friends. If at some point you can assist them with anything that would be good”. Saloojee told the Commission he saw the meeting as a display of the influence the Guptas had. Some weeks later he was apparently “summoned” to another meeting by Essa and his evidence indicates he felt pressure on him to engage (with the Guptas) again adding he was “reluctant” to attend. Other meetings followed where Duduzane Zuma, a man introduced as “Ace Magashule’s son”, Essa and Rajesh Gupta were present. Saloojee claimed Essa said “they had the support of Number One and the old man. 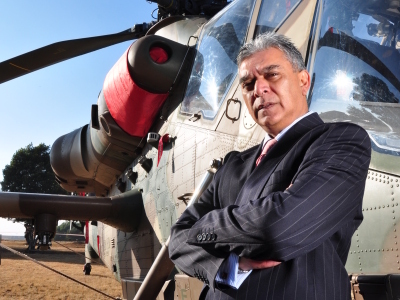 “It became clear to me they wanted to enter the defence environment and they had seen Denel as a vehicle to enter the defence environment,” Saloojee said. His evidence shows the Guptas may have been plotting a 2016 partnership with Denel into the Indian market as early as 2012. In January 2016, the formation of Denel Asia was announced. It was said to be a Hong Kong-based joint venture between Denel, with a 51% holding, and Essa’s VR Laser. Had Denel Asia become a reality it would have seen Denel’s intellectual property sold off to India with minimal benefit to the South African state-owned defence and technology conglomerate. A further meeting, where only Rajesh Gupta and Salim Essa were present, saw Saloojee reportedly tell them he had no problem if they wanted to do business with Denel, but it had to be done “the proper way”. Saloojee said his firing in April 2016 was because he refused to cooperate with the Guptas and their desire to capture Denel. He said Rajesh Gupta offered him money for his co-operation, but he refused. “I did everything in my ability to protect Denel from taking it from a sustainable organisation. I was aware of that at some point if I did not do what I was asked to do, who knows where we’d be. I do know that I was gotten rid of because I stood in the way of what their project was,” Saloojee said. Former Denel board chair Martie Janse van Rensburg and Kgathatso Tlhakudi, deputy director-general in the Department of Public Enterprises are the only other witnesses as yet called to testify at the Zondo Commission in connection with Denel. Some of their testimony corroborated what Saloojee said about the capture of the Denel board in 2015, when it was almost entirely replaced by members picked by then Public Enterprises Minister Lynne Brown – normally Denel would evaluate candidates. Saloojee in his testimony said the appointment of Daniel Mantsha as chairperson of Denel in 2015 was part of the “takeover” of Denel. In July 2015, the company’s Zwelakhe Ntshepe informed Saloojee that Essa wanted to meet with him so he could introduce him to the new chairperson of the board, Mantsha. He said Mantsha and Essa had an “understanding”.